SAN FRANCISCO, CA, Oct 25, 2016 – SmarterBetterCities announced its new CloudCities release with Web-based 3D data mashup and advanced editing capabilities. The new CloudCities is now available at www.cloudcities.io. 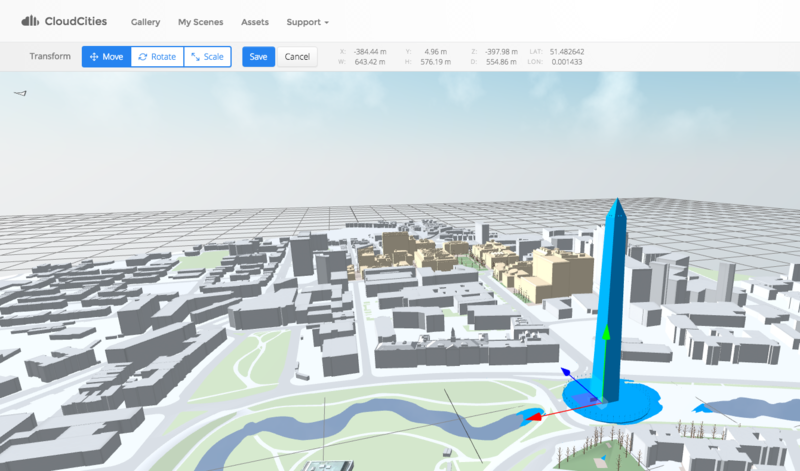 CloudCities is an online platform for visualizing, editing, and publishing interactive 3D city models. It dramatically simplifies creating 3D plans and combining data with it. With the new version, users can now take full control over their 3D content by adding, moving and transforming 3D assets. CloudCities now supports even more available input formats for adding 3D content. Data attributes linked to the 3D objects can be managed directly with the all-new spreadsheet-style attribute editor. The new 3D Editor makes the 3D content creation process a lot easier. Multiple files and 3D assets can be added to the scene directly. The all-new transform tool allows moving, rotating and scaling of the objects in the scene. Objects can be moved between layers by the push of a button. Users now have full control over their 3D scenes. 3D data mashup is revolutionized with the new attribute editor. Selected objects in the 3D scene are displayed in a spreadsheet showing all the connected data attributes. Values can be mass-edited as one would be accustomed to in any spreadsheet software. Hit save and all the data is connected to the 3D objects. Managing your 3D content becomes even easier with the asset manager, giving a complete overview of your 3D assets. Whether they are buildings, cars, street furniture, or any other 3D assets, they are now readily accessible through the asset manager. Assets can be searched, tagged, and previewed. CloudCities is the leading platform for publishing interactive 3D city models. It runs in any Web browser and on any mobile device, no plugins needed. Share on social media, or embed the 3D viewport directly into your own website. CloudCities enables customers from various industries to publish 3D models and link analytic data. CloudCities is developed by SmarterBetterCities, a fast growing 3D Web startup based in Walnut Creek, CA, and Zurich, Switzerland, founded in December 2012. This entry was posted in CAD-CAM-CAE, Featured News on October 25, 2016 by Sharmila Guha.